I was very soon back in Germany, this time with various oddities as objectives; a special train from Leipzig over a closed line (Eilenburg to Bad Düben) which I’d already missed, and a forthcoming threatened closure. 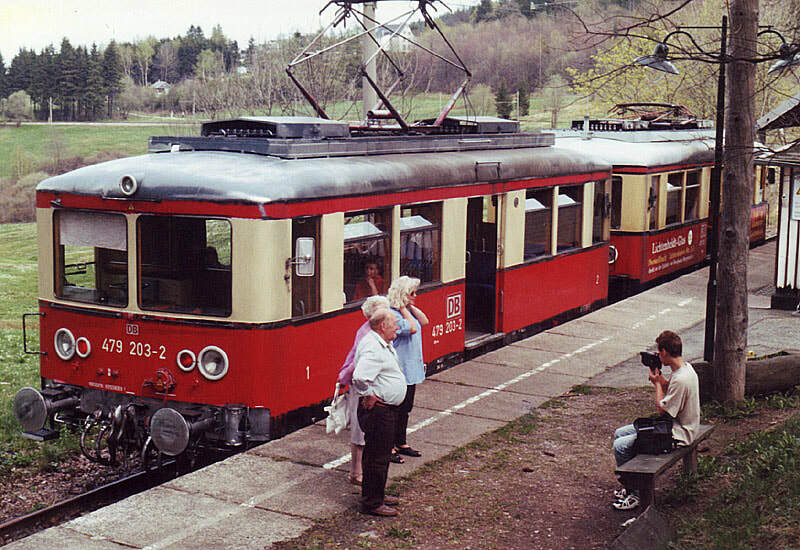 This was the Gaildorf to Untergröningen line near Stuttgart. In the event it didn’t close, but long experience says ‘if you get the chance of track, do it’, so I did! Also there was the seasonal weekend service over the Güterglück Kurve (a Berlin-Wernigerode & vv train pair), and the usual assortment of gaps to be filled in. A somewhat cold and uncomfortable night in the car park at Stansted preceded the discovery that Bewley’s fry-up emporium is no more. Alas. There is a Granary air-side - a bit pricey at just over 6 quid for 6 items and tea. No toast, no time and it didn’t look very appetising anyway. Next time, maybe. [Every time I use STN I say there will be no next time. But I keep getting drawn by the low fares…]. The ‘dead track’ as far as Altenbeken allowed a very modest amount of kip to be regained. Altenbeken turned out to be a nice looking place and quite warm with the sun out. The junction is west of the station so at some stage it will be necessary to go to or from Paderborn from or to P2 or P1 on the Holzminden line (sheer stupidity on my part; I should have got off the IR at Paderborn this time). A very pleasant, nay even scenic run ensued, Höxter in particular looked to be a very well cared for market town. The 28 minutes booked at Holzminden is inexplicable though it does provide a reason for the very slow overall journey and the apparent running of two trains [train number changes at Holzminden]. ‘Twas not to be. Never mind. The junction appears to be east of Seesen as all trains to Bad Lauterberg etc go from P4. Also, SuX there is a 2 hourly service to Göttingen which must do one of the connections at Kreiensen. Seesen - Goslar could well be new track – check map upon return! I wonder why I’ve been stuck at Vienenburg so many times. Irritating today to have the option of doing the direct Oker - Vienenburg line having been out specially to do it quite recently. I went via Bad Harzburg today by way of a change, noting the 232 waiting at Goslar. A tactical decision had to be made as to whether to decamp at Wernigerode assuming that the 1805 Berlin was OK, or whether to continue to a (usually refreshment-free) Halberstadt where there is a better escape route via Magdeburg. Hunger won, and I went for Wernigerode. The snack bar outside the station was still functioning (just - closes at 1800) and provided me with a freshly made mayonnaise free ham roll and a can of Hasserode. This set a new record for breakfast (1750) and last night’s supper if you discount two chocolate bars. It was arguably the most enjoyable ‘meal’ of my life. I had already checked the parish notices which informed me that the 1805 was running, and going via Magdeburg and Prödel, and I had time for some nice evening light shots of the Harz’s 0-6-0T and two of the 2-10-2Ts, so the Wernigerode decision was a good one. Unfortunately I didn’t have time to phot the two Mallets which were slightly further away. 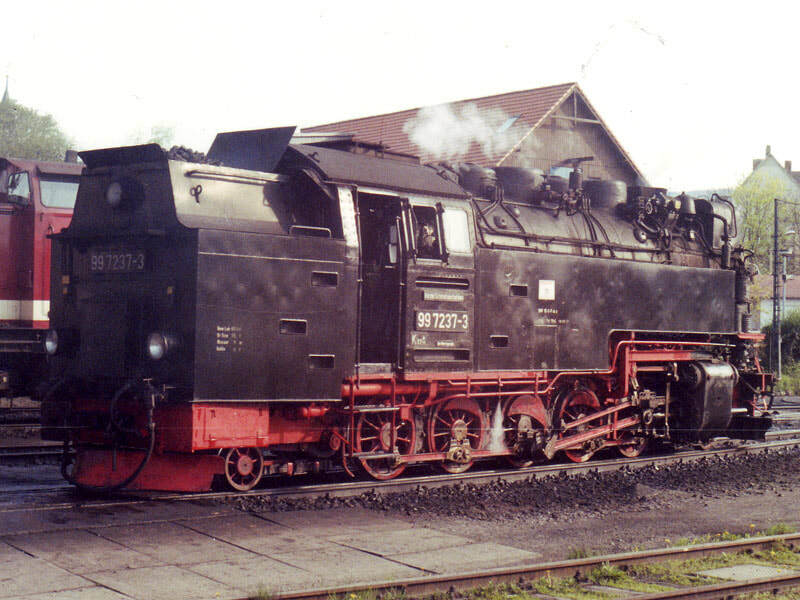 232 453 (I think) provided power away from Wernigerode. 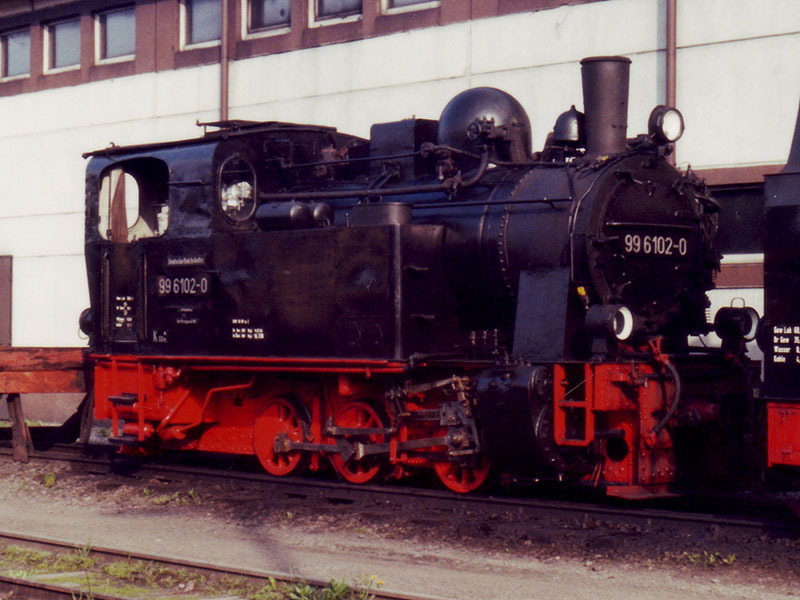 232 352 (allocated to Rostock) brought in the ECS. As far as I can gather the two ran top and tail to Halberstadt as 352 was train engine on to Magdeburg. At Magdeburg the merry throng on the platform included an old friend, DM, who also required the Güterglück Kurve and was grateful for the seat next to me which was almost the last one free. Nothing I said, honest. The Hotel Tauenzien [in Berlin] was just about adequate but compared very unfavourably with what you’d get for DM120 elsewhere [well, not the UK or Belgium obviously, but elsewhere in Germany]. The very, very slow but helpful receptionist/concierge/general factotum kindly agreed to provide breakfast when she arrived back at 0700. Two weissbiers and a McDonalds with DM later, I finally got some overdue sleep. Breakfast eventually forthcame, very slowly by about 0710 and I made it to Zoo with at least 1½ minutes to spare for the 0739, IR2103 to Konstanz. IR2103 turned out to have a very undemanding schedule and pootled along very peacefully. I took some of the time to review the day’s plan and it appears that Erfurt – Arnstadt – Saalfeld – Rottenbach – Cursdorf - Katzhütte is a runner, subject of course to timekeeping and to the alleged closure of Katzhütte which the DB website doesn’t seem to know about. IR2103 pootled punctually into Erfurt at 1101 giving time for the purchase of a phone card before a 229 arrived with 1113 to Schweinfurt which I took as far as Arnstadt. A 2 car DMU did the job from Arnstadt to Saalfeld. Very alarming to see parish notices at Rottenbach but on returning on the same unit (now an RE not RB) they turned out to be confirmation of the Obstfelderschmiede - Katzhütte bustitution. On that basis, plus the fact that two karts were waiting, one labelled Rudolstadt and one Katzhütte, I decided to stick to the plan and just leave out the bus bit. 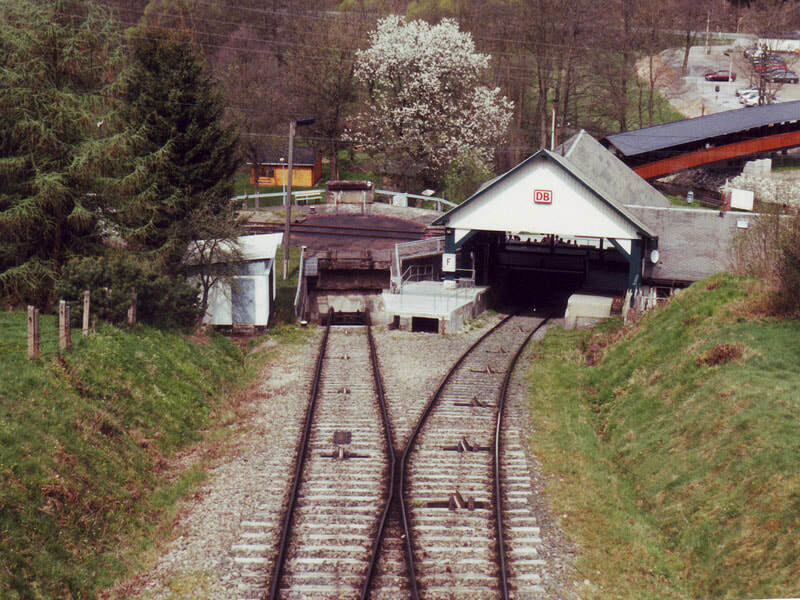 The complicated wagon transfer arrangements at Obstfelderschmiede can be seen in this photo taken from the approaching funicular car on 23.4.00. The Katzhütte branch passes from right to left of the picture just behind the funicular station. (later) What a wise decision, for once! The line to Obstfelderschmiede is well worth doing in its own right - very picturesque and steeply graded. The Bergbahn (O/schmiede - Cursdorf) is something else. The DB map shows non electrified line for a short distance, then electrified. The Euorcart map shows the whole thing as a rack line. I therefore expected a conventional kart followed by an electrified rack line. In fact the first 1 km is a funicular and the second part a 2 car EMU of extreme age. The funicular has (obviously) two vehicles, one dedicated ‘stepped’ passenger car and the other carrying a conventional 4 wheel trailer on a funicular version of the ‘rollwagen’. This was also used for freight, presumably, as there is a turntable at the bottom with exchange sidings connecting to the Katzhütte line. It pays to go one way on each vehicle, since that way you get to do both halves of the passing loop and also the ‘passenger’ (dead end on a curve) and ‘freight’ (straight on, to the turntable) spurs at the bottom. The EMU on the ‘conventional’ line at the top of the hill is in ‘S-Bahn’ crimson and cream livery and has doors which close with alarming ferocity. Other than that, and the tram-style OHLE, the line is (compared to the funicular) unexceptional but it’s a very fine museum piece and well worth the DM 15.20. Back at O/schmiede I had clocked the Bergbahngaststätte on the way out, which alleviated any worries about the hour or so’s wait for the kart not to go to Katzhütte. In the event a ‘Traditional Thüringer Bratwurst vom Grille’ and a litre of a very acceptable draught pils whiled away the time very satisfactorily. All in all, a highly valid outing. 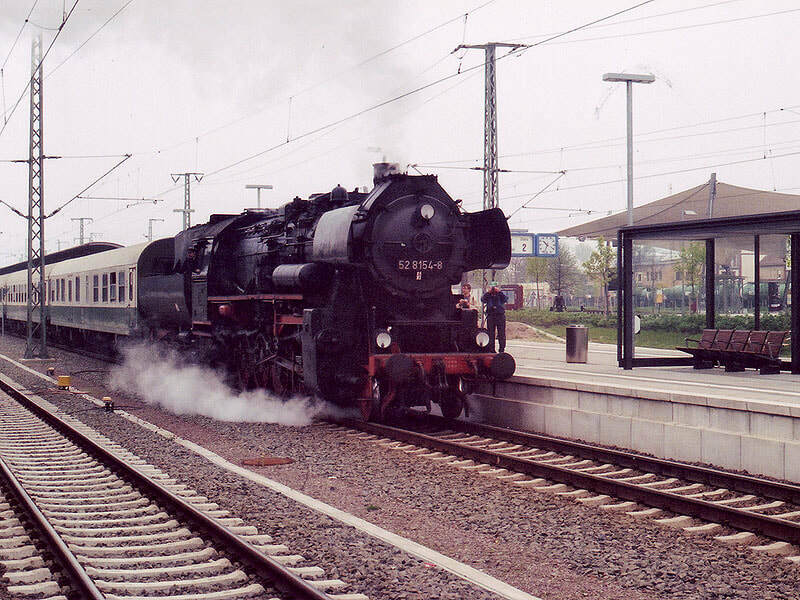 Some odd antics occur at Rottenbach - in order to keep P2 and P3 free for Erfurt - Saalfeld and still pass branch trains, the Obstfelderschmiede train waits outside the station. 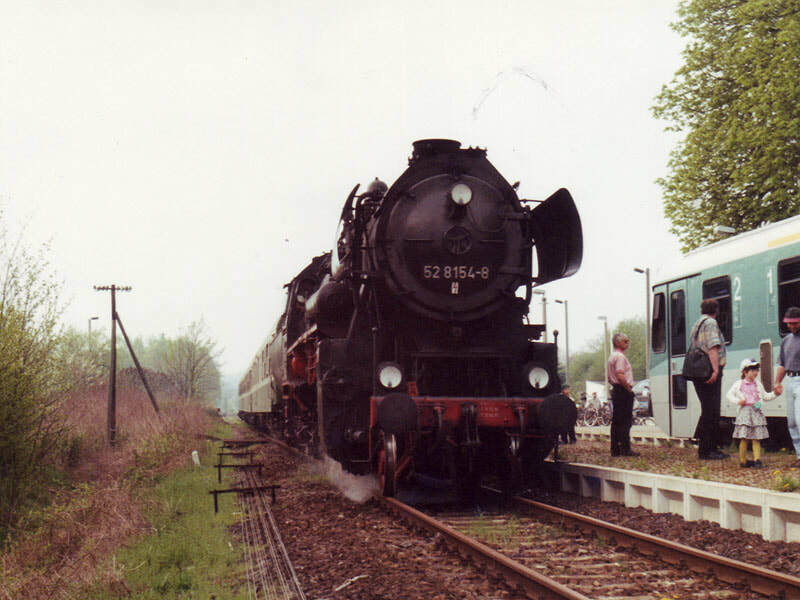 The Obstfelderschmiede - Rudolstadt train stops at the station, runs past to allow the other train to pass, then reverses back to P1A. This was enhanced today by the 1705 to Obstfelderschmiede being top and tailed by 202 335 and 202 525. On to Rudolstadt where the RB to Großheringen was running a bit late - shock, horror. We were further delayed just before Orlamünde because of single line working which to my delight was via the loop at Orlamünde (main line is being relaid) thus completing the physical connection with the Poßneck u.Bf. branch. A busy moment at Rottenbach on 23.4.00 with 202 335 and 202 525 top and tailing an RB, and two 628s, working Katzhütte and Rudolstadt services. The IC was also late (10 mins at Jena) and was further delayed by extensive engineering at Jena and Camburg. [Which makes me wonder if I’d have got to Großheringen even if I hadn’t been stupid… ] It was 13 late at Naumburg according to the K-Buch but billed as 1943 on the departure indicator therefore only about 2. It made the quickest stop I’ve seen from any train, anywhere that stopped at all. Helped by this arrival at Leipzig was a mere 7 late at 2019 and with the help of a tram I was in the Mercure by 2030. Breakfast at 0700 (starts 0600) proved excellent with an ‘English’ option which I declined on a coals to Newcastle basis. On arrival at Leipzig Hbf I ascertained that there was indeed and 0804 Sonderzug to Bad Düben and Lutherstadt-Wittenberg. Having nipped off to visit Nimm’s and the cash machine I located the train, then noticed the smoke… It turned out to be 52 8154. 11 out of 10 to my informant, but only 1 out of 10 for not telling me it was a dampfzug. Regrettably 0 out of 10 for saying that ordinary tickets were valid! A very unpleasant individual with a loud voice relieved me of DM60. I suppose for steam over a closed line that wasn’t too bad. Lucky I went to the cash machine. The 52 has just arrived at Bad Schmiedeberg after using the freight-only line from Eilenburg to Bad Düben. A thoroughly excellent bash, as it turned out. Fairly well patronised but not so much that I had to share ‘my’ compartment. Not too many photters either so there was a chance for a phot at Bad Schmiedeberg. A brisk pace was made including the closed line, which is actually in use for freight at least from Eilenburg to Mörtiz. The Krieg was worked hard wherever possible which as it only had 3 coaches was basically only up the occasional modest ‘banks’. At Lu-Wittenberg the assembled cranks didn’t have enough wit to charge across to P4 where a clear view, lit from the right side, was to be had. Consequently I was able to get several clear shots of the departing ECS. Excellent. ‘Therese Giehse’ (again, used Jena-Leipzig last night) was on time but had spare seats only with the pariahs. I considered staying with her to get to Crailsheim earlier but with no sensible fill-in moves at Crailsheim, the prospect of passive smoking backwards all the way from Leipzig to Nürnberg was too grim for comfort. I stuck with the plan and decamped at Leipzig to join 219 093 on 1159 to Plauen. The Werdau force field (one line still o.o.u. Crimmitschau - Werdau) was in good form and we were 15 late leaving Crimmitschau after awaiting a late-running northbound train. The timings are generous however, and after suitable effort from the 219 arrival at Plauen was 1 minute early. 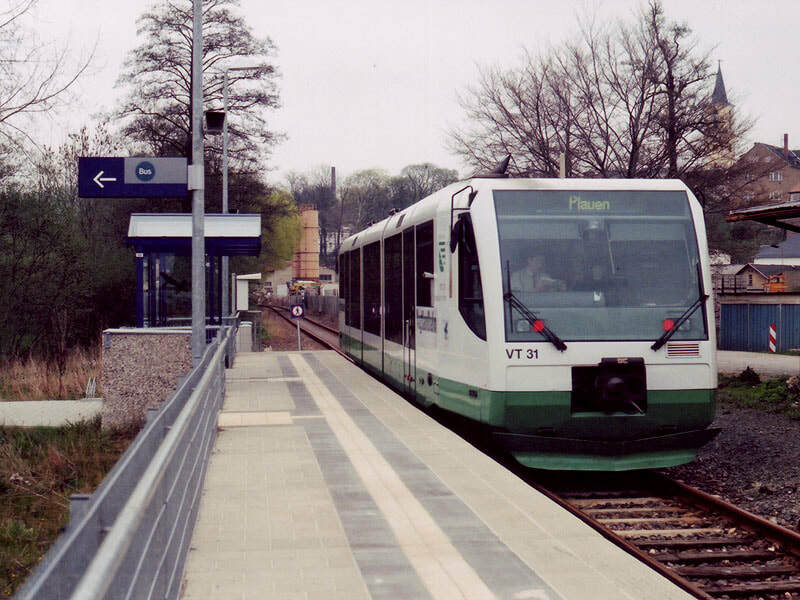 The 1410 to Schleiz West turned out to be a Vogtlanbahn RegioSprinter. 219 015 with DR livery coaches was standing at Meltheuer. The Schleiz branch was fairly routine - probably looks better on a sunny day - though apparently having freight traffic into ‘Schleiz Goods’. Schleiz West is in the town, next to the bus station. The line on to Saalburg is still there but rusty. The line to Hirschberg is also apparently in good condition and well used - it goes off between the Schleiz and Hof lines at Schönberg. I returned to Meltheuer to reduce the waiting time. 13 minutes there was actually 16 minutes too long as the Hof train was 4 late and remained so all the way to Hof, where a tilting thing was waiting to go to Nürnberg. 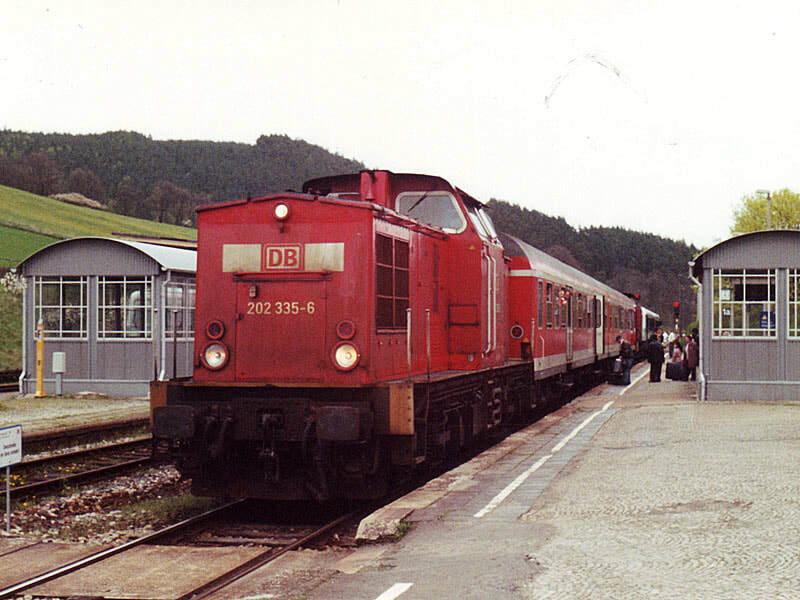 A Vogtlandbahn Regiosprinter at Schleiz West on the afternoon of 24.4.00. The tilting thing (I think - much improved if it was) did fairly well with a very fast schedule of 66 minutes for 85 miles (plus another 12 for stops) and arrived at Nürnerg Hbf at 1808 near enough. The 1844 was already standing at P14 and as the station was extremely busy I purchased and emergency baguette and went to secure a seat. This was in retrospect A Good Thing as there weren’t many unreserved ones. Crailsheim was also apparently (not finished yet) A Good Thing. The Schwarze Bock is indeed only a few minutes from the station, costs 65 DM for B&B, has an English speaking landlady quite calm about people going out at 0500 and coming back for breakfast, and is really nice. So far so good. The Bridge Inn is currently providing weissbier and entrecote… Very good it was too though priced à l’Italien with spuds (hooray) and salad (boo) extra. The Prinzregent Luitpold (of Bavaria around the turn of the century, the last one that is) weissbier was top grade. Nevertheless, an early night was had (well, -ish anyway). 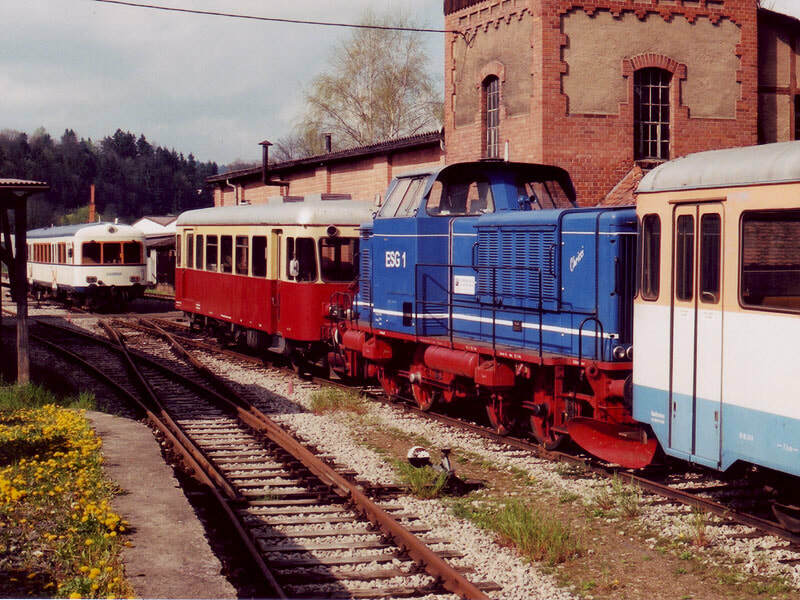 A variety of WEG stock at Untergröningen on 25-4-00. The unit on the left was working the branch that day. Up at 0415 for a shower and the 0505 to Gaildorf West. All well until I decided to check the train times. Oh, expletive deleted, several times. 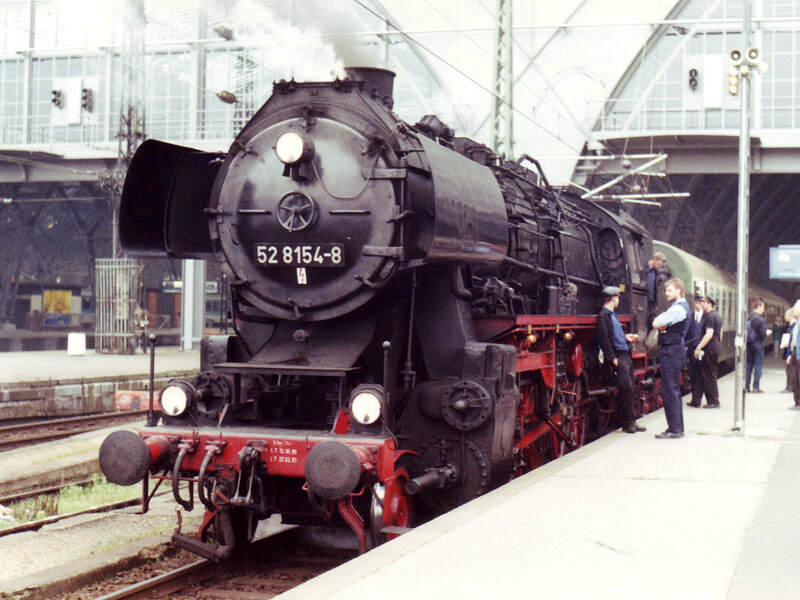 The 0751 Gaildorf West-Crailsheim is a (6) not an (A). How many more times am I going to trust my failing eyesight. Huge reappraisal when I got to Gaildorf but with no taxis around the only proper option was to abort the mission and wave goodbye to the Untergröningen kart which arrived on time at 0600. Funny old thing it is too. As a poor substitute I settled for a trip to Backnang and back to Crailsheim rather than stand about in the cold. When I got back to Crailsheim I enjoyed a very pleasant breakfast then realised I could get back to Gaildorf West by 0930 with an outside chance of getting to Untergröningen by 1100 for the kart back to Gaildorf. Thence on to Stuttgart and (hastily) to Düsseldorf. Well, what the heck. Pausing for a listen to an 8 minutes late, fully thrashed 218 at Schwäbisch-Hall-Hessenthal (catchy) I got to Gaildorf at 0930. The bus option didn’t exist, no taxis. I decided to walk to the town to find a taxi rank. Did so, hot, heavy bag, about a mile. Found it. No taxi. Spotted a taxi going round the one way system - will it come on to the rank - yes it did. Delightful lady agreed to take me to Untergröningen for a mere DM45. Oh well. She dropped me at the station where I took some phots then decided a beer was in order. I found a pub, wandered in, ordered a beer, was offered a bock and two others, went for the bock (an Oster Bock in fact). It came in a glass with ‘Lamm Bräuerei Untergröningen’ on it. I made further enquiries. I’d only stumbled on a brew pub, hadn’t I. The Oster Bock was excellent (times 2). Just to gild the lily the landlady produced a home brew pub guide to Germany. Back at the station the kart was being fuelled (a petrol station type pump beside the line) and watered (yep, a can). The driver said he was ‘not sure’ if passenger services would continue. There is freight traffic (timber) but the 3 normals and 1 crank on the unit can’t be sufficient for profitability. The dates of steam trains were noted for dissemination. Once departed, the taking of various phots through the open cab door was sufficient for an invitation to ride in the cab. Thus ended a most satisfactory revival in my fortunes. The driver confirmed that freight traffic, which runs SuX and is handled by two diesel locos, is the main event. There is an oil siding near Gaildorf as well as the timber. Back at Gaildorf the SE turned up a bit late but still made the connection with the S-Bahn at Backnang. The S-Bahn arrived at Stuttgart Hbf at 1245 in good time for 1311, EC18 Innsbruck - Dortmund which runs through to Düsseldorf. EC18 left Stuttgart on time but suffered signal (?) delays before Mannheim and TSRs on the Koblenz - Köln section, resulting in a 15 late arrival at Düsseldorf. Very fortunately I’d secured a forward facing seat away from the sun at Stuttgart as the train was full and standing all the way to Bonn. At Düsseldorf I had just enough time to U-Bahn it to Heinrich-Heine-Allee and dash down to Zum Schüssel for a home brewed altbier. Very welcome on a warm afternoon. The S-Bahn was in a shambles when I got back to D-Hbf but the 1805 finally materialised about 1810. Return to Stansted and Telford was uneventful with Buzz being more punctual this time though the 40 minutes it took (as usual) from plane to car was irritating. I ended up with a day left on my EuroDomino ticket from this one. There was a very cheap fare offer (joint effort by Buzz, the KLM budget spin-off, and the Daily Express 'newspaper'). This irresistible combination provided a flying visit to Germany the next month.